UPDATE: It's fixed. Go here for details. UPDATE: If you need to load in a framed state, disabling the Spockholm toolbar works. Team Spockholm has been notified. Mafia Wars players are used to the white screen load but this time it's affecting all games. Thankfully there is a work around as loading the game unframed will work. 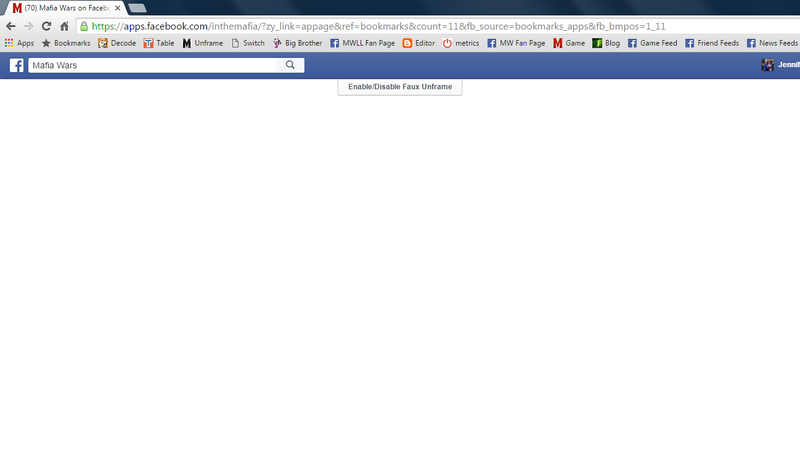 Since this is affecting all Facebook games, I imagine it will probably be fixed sooner than later. The Facebook known issue page can be found here. Thank you. That worked fine for Chrome and Comodo Dragon. Pale Moon [FF] went right into the game. Is this part of the human experiment I read about where FB wants to know just how addicted we are? It's supposed to be just a test for Android machines, but that sort of limitation has never before stopped IT pros from breaking everything. and who wants to play the game without the Spockholm tool bar LMAO this is pathetic ! My game loads just fine but I'm having a problem copying/pasting my ices now. I've been using the Click Trap Remover extension but it no longer works for me. I have the latest version so not sure how to fix this. Any ideas? live is sometimes frustrating, even if not playing games. No more MW for me, but I still appreciate all of the help Jennifer gave me with my now gone forever addiction. Jennifer is a jewel,and if I'm ever in a hospital, I could only hope to have someone like Jennifer looking at x-rays, figuring out dosages....or whatever she does. About the game, MW was fun while I played, and I always checked Loot Ladies blog when something new showed up. You all have fun, 'cuz it is a game, and respect one who helps. 'Nuf said....or it should be enough, Still have lots of RP's left on my account, but haven't seen how it could help all of you out.....suggestions?